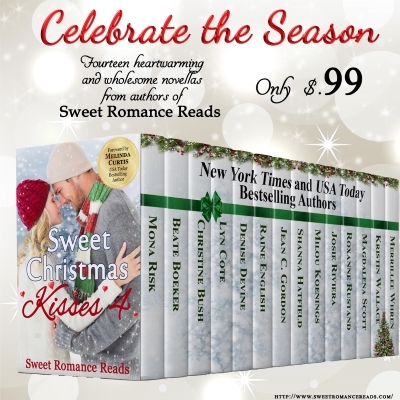 This month, we're offering sneak peeks at the first chapters of Sweet Christmas Kisses 4, a brand new collection of 14 heartwarming all-new, stand-alone stories from New York Times, USA Today, national bestselling, and award-winning authors. Sweet Christmas Kisses 4 takes you from the Pocono Mountains to sunny Florida, and as far away as Portugal. 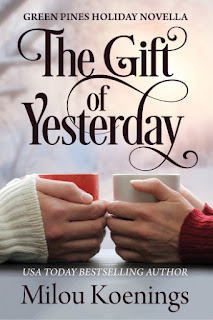 This is the first chapter of The Gift of Yesterday, the fifth book in the Green Pines Romance series. The day of her aunt’s funeral, Bailey baked two hundred lemon cookies, three loaves of bread, and a dozen milk rolls. She emptied the kitchen of fruit and ended up with half a dozen pies: four apple, two blueberry. By then it was dawn. She delivered the grief-soaked lot to Sister Xavier at the homeless shelter where her aunt had volunteered and went back to her empty apartment. There wasn’t so much as a slice of bread left for her breakfast. Bailey, who had been up almost thirty-six hours straight, made herself a cafe crème like the ones she’d had in Paris and felt the house settle heavily upon her shoulders. The tenant upstairs was getting ready to go to work—her heels clacked across the hardwood living room floor overhead. Her tenant, now, Bailey realized. 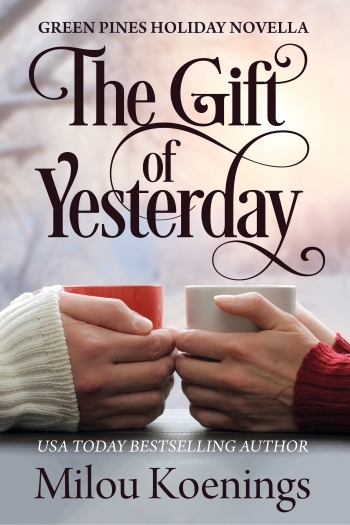 Cup in hand, she walked slowly through the rooms of the first floor apartment she’d shared with her aunt. What had been homey and comforting a week ago now seemed impossibly foreign to her. The needlepoint tapestry above the sideboard, the cut-glass candy dish still filled with nonpareils, the avocado-green refrigerator Auntie Muriel hadn’t replaced since 1978, long before Bailey was born. 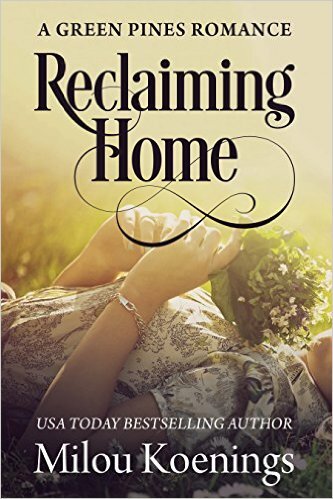 Bailey had been living in these rooms since she’d been fourteen years old, yet none of it seemed to have anything to do with her. Only a wood-carved giraffe on the mantel in the living room gave her pause. She traced the giraffe’s graceful neck with a finger. She remembered buying that with her parents as a gift for Auntie Muriel when they’d gone on safari in South Africa. Bailey even remembered wrapping it up and taking it to the post office to mail. Now only she and the giraffe were left. You can come with me, Bailey thought. Where, she didn’t know. She’d figure it out later. Bailey crawled into bed and slept for twenty-four hours. When she woke up, the plan was fully formed in her mind, as if it had been assembling itself in her subconscious during the last two years of Aunt Muriel’s illness. She could have done the safe thing, stay put and keep her job. She could have gone back to Paris, where’d she’d lived since she’d graduated high school and had gone to culinary school. If not for finding out that Aunt Muriel had cancer, Bailey would probably still have been there, only coming back to Chicago twice a year for visits. But it had been two years now; most of her friends there had moved on. And as she’d often discussed with Aunt Muriel, Paris, with a café on every corner, wasn’t the best place to open a pastry shop, no matter how amazing you were. Instead, Bailey pulled the crumpled magazine article she'd been carrying around in her messenger bag for the past six months. She smoothed the pages and stared at them. The new restaurant review section from an old issue of Chicagoland Magazine. It was a glowing article about the hottest restaurant in the country that was attracting celebrities from both coasts, flying in for a single meal—in a small town Bailey had never thought she'd see again. She powered up her laptop and started making lists. After a few hours of steadily cranking out emails to suppliers, she stretched and went for a walk to clear her head. She went two blocks to Lincoln Park and crossed the park to the lagoon. Bailey stared at the late afternoon sun on the water. It was the end of summer. A jogger in a tank top huffed past her. Bailey turned back, leaves crunching underfoot. In the distance, on the other side of Lake Shore Drive, the white triangles of sailboats skimmed the horizon of summer on Lake Michigan, unaware that winter was on its way, was, for some, already here. That was how Bailey came to Green Pines. Pre-order Sweet Christmas Kisses 4 for only 99 cents and it will be delivered to your e-reader when it releases, on September 26. 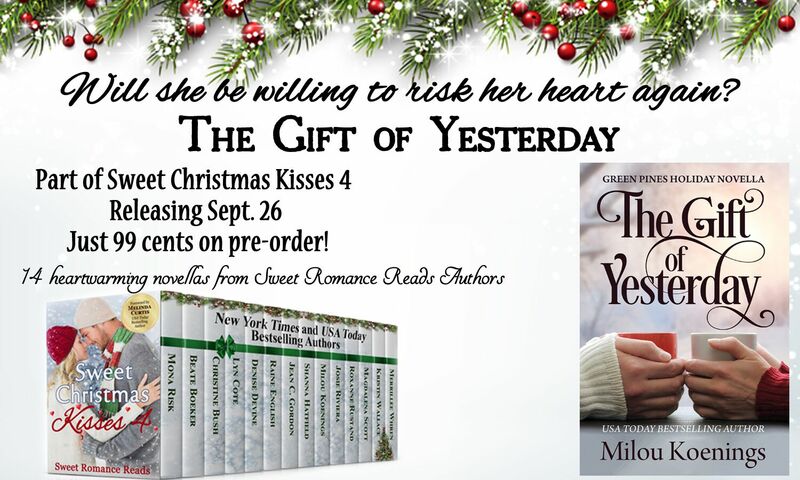 Please join us for the the Sweet Christmas Kisses 4 Facebook Launch Party on Tuesday, September 26th. We'll be having games, giveaways, and lots of fun! Her other Green Pines sweet romances, I Love You Three, The Kampala Peppermint Twist, Reclaiming Home,and Sweet Blizzard are available on Amazon, Amazon.uk, iBooks, Nook, Kobo and all your favorite e-book retailers. Sign up for Milou's newsletter, so you'll be first to know about new releases! 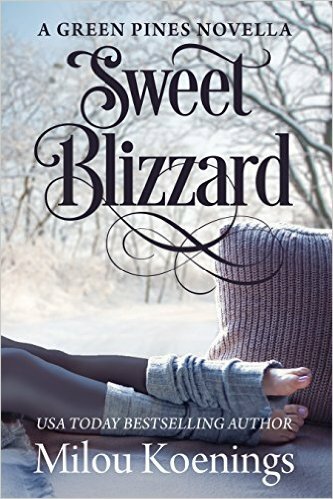 Don’t forget to sign up for the Sweet Romance Reads newsletter. Scroll down the right side of our blog and enter your email address under Newsletter Signup. And please stop by the Facebook Sweet Romance Reads Cafe , where every so often we have the greatest parties! Fabulous writing, Milou! Can't wait to see what happens next for Bailey. Thank you so much, Josie!